You can choose to create a new image, open an image, or choose from a list of images recently opened in Acorn. If you do not want this window to appear every time you launch Acorn, uncheck the box in the lower left hand corner. If you want this window to re-appear, choose the Help ▸ Welcome To Acorn menu item. To create a new image, choose File ▸ New (⌘N) from the menu bar. You can choose a preset image size, or you can enter your desired dimensions manually. If you are manually entering the dimensions, you have the option to use different measurement values including pixels, inches, and centimeters. You can also select your image resolution and background color. For more information on resolution and PPI, read all about DPI, PPI, and printing. 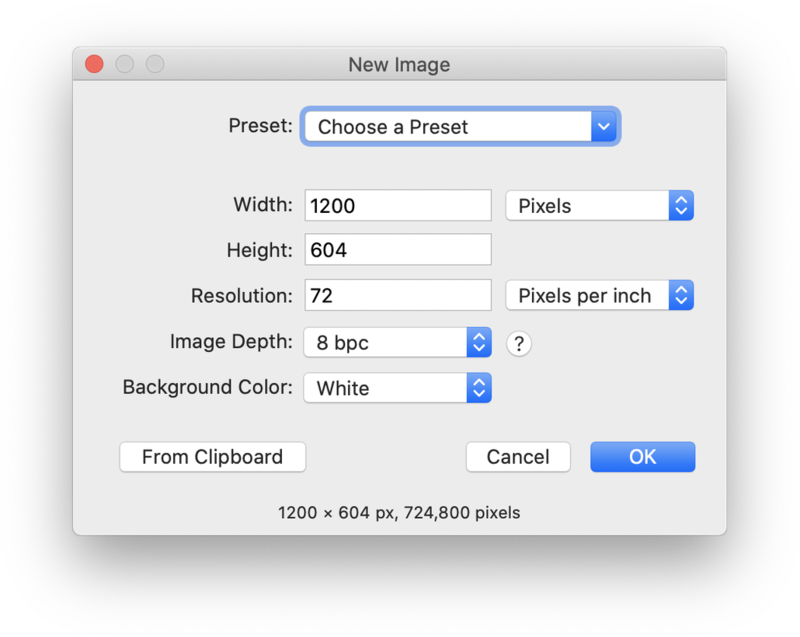 To create a new image preset, enter the width and height values into the appropriate fields then click on the preset drop down menu. Choose 'Save Preset'. You will be prompted to give your preset a name. In order to delete a preset you have created, hold down the option key while clicking on the preset name. A window will appear to confirm that you want to delete the preset. You can only delete custom presets. To open an image, choose the File ▸ Open menu item. You can also drag and drop images onto Acorn's icon in the dock. If you would like to combine two or more images together, use the File ▸ Add Images... menu or drag and drop your images from the Finder into Acorn's canvas or layers list. If you add a single image via the File ▸ Add Images… menu item and it doesn't fit on the canvas, Acorn will begin a scale and rotate transform for you. The image will automatically be scaled to fit into the canvas. If you want to pop out of the scale, pressing the ESC key will end it. 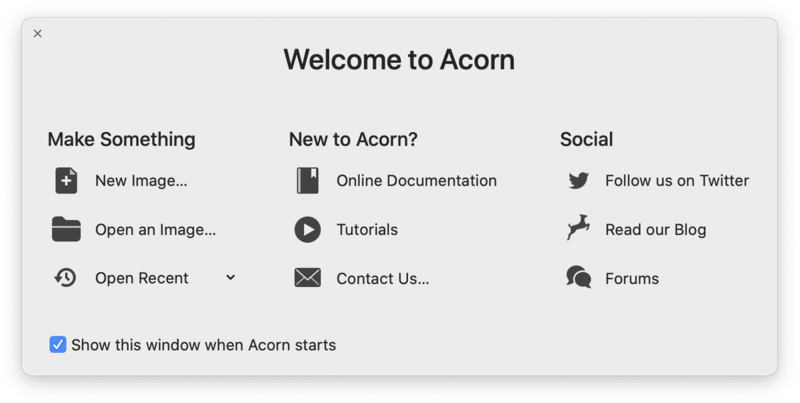 If Acorn is running and you have an image on your clipboard that you would like to open in Acorn, right-click on the Acorn icon in the dock and select "New Image from Clipboard”, or choose File ▸ New from Clipboard from the menu. If you have a https: URL to an image on the clipboard, you can choose File ▸ New from Clipboard and the image will download and open in Acorn. Also make sure to read up on Adding Images and Resizing Layers which describes how to combine and resize images. Tip: If you can only see a small portion of your image, try zooming out using View ▸ Zoom Out or dragging the slider found on the lower right hand corner of the window to the left. Alternatively, you can use View ▸ Zoom To ▸ Fit in Window. If you are wanting a specific zoom percentage, click on the zoom percentage number located on the lower right hand corner of the canvas and enter a value. You can save images by selecting File ▸ Save or File ▸ Save As. When working with an image editor such as Acorn, it is a good idea to always work off a copy of an image rather than the original. When in doubt, select File ▸ Save As and re-name the file so you don't accidentally make permanent changes to your original image! Also, be aware that saving certain file types will "flatten" your layers so that you cannot edit them easily later. 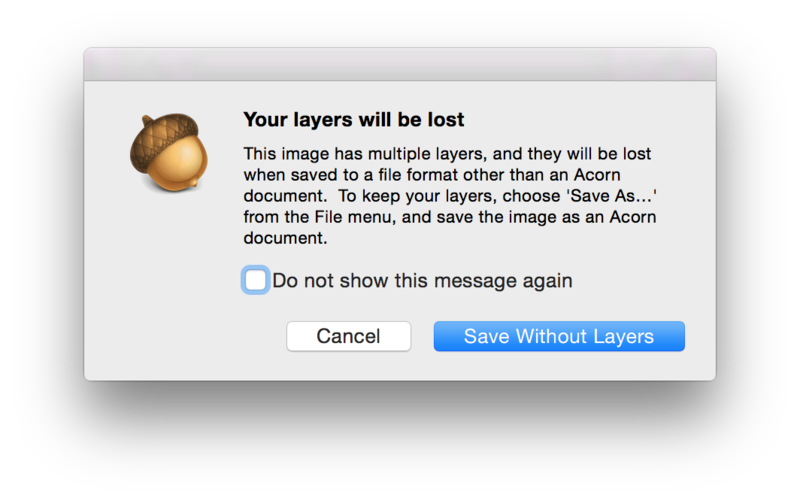 Acorn will warn you if you are at risk of losing your layers when saving, unless you have checked the 'do not show this message again' box. When in doubt, be sure to save a copy of your file as .acorn. Using Acorn on OS X 10.7 or later gives you the ability to use autosave and access previous versions of your image using Time Machine. This feature is off by default, but can be enabled in Acorn's Preferences under the General tab. With autosave your changes are saved automatically for you. Versions of your image will automatically be created every hour, and every time you open the file. To view previous revisions of your file, use the File ▸ Revert To ▸ Browse All Versions… menu item. You can find out more about Autosave and Versions from Apple: OS X Lion: About Auto Save and Versions. Acorn files are the native file type of Acorn. This is the most robust file format that Acorn supports. When saving in this format all of your layers, grid settings, text and shapes are saved. You are able to edit them when you re-open the image. This is the recommended format for editing images with layers in Acorn. If in doubt, save your image in this format. AI stands for Adobe Illustrator Artwork. Acorn can open Adobe Illustrator files that have been saved with PDF compatibility turned on. Acorn cannot save or export images in the AI format. Read more about AI on Wikipedia. BMP is a popular image format on Microsoft Windows. Acorn can read and write BMP images. Read more about BMP on Wikipedia. GIF stands for Graphics Interchange Format, and is a lossless 8 bit image format. Since GIF files can only use up to 256 colors in an image, you will only want to use this format for specific web applications. Acorn can read and write GIF images. Read more about GIF on Wikipedia. HEIF stands for high efficiency image file format. A HEIF file can be a single image or a sequence of images. Acorn can open HEIF files. Read more about HEIF on Wikipedia. ICO stands for Microsoft Icon. Acorn can open, export, and save .ico files. To save a .ico file it must be square and 16, 32, 48, 128, or 256 pixels in size. Read more about Microsoft Icon on Wikipedia. JPEG is a very popular image format used primarily for photographs. Since JPEG is a lossy format, it is not ideal for graphics with text. File extensions for JPEG are .jpeg and .jpg. If you prefer to save with the .jpg extension, manually enter it in the "save as" field as the file extension. Acorn will remember that you prefer .jpg over .jpeg next time you save. (Only available in the direct version, due to restrictions Apple places on applications distributed via the App Store). Acorn can read and write JPEG images. Read more about JPEG on Wikipedia. JPEG 2000 was designed to be the successor to JPEG. Acorn can read and write JPEG 2000 images. Read more about JPEG 2000 on Wikipedia. PDF stands for Portable Document Format, and is an open standard developed by Adobe Systems. Acorn can read and export PDF files. When opening a PDF in Acorn a window will appear allowing you to set the resolution and background color. Read more about PDF on Wikipedia. Quoting Wikipedia, "PICT is a graphics file format introduced on the original Apple Macintosh computer as its standard metafile format." Acorn supports opening .pict files. Read more about PICT on Wikipedia. PNG stands for Portable Network Graphics, and is a lossless 32 bit image format. If you need to have crisp text or transparency in your image, PNG is the way to go. Acorn can read and write PNG images. Read more about PNG on Wikipedia. PSD is the native file type for Adobe Photoshop images. Acorn does its best to open PSD images, and if possible, preserve layers. Photoshop layer styles, and editable text are not supported. Vector and text layers are opened as bitmap layers. Acorn supports writing PSD files via File ▸ Export. Quoting Wikipedia, "A camera raw image file contains minimally processed data from the image sensor of either a digital camera, image scanner, or motion picture film scanner. Raw files are so named because they are not yet processed and therefore are not ready to be printed or edited with a bitmap graphics editor." Acorn can import any RAW image that Mac OS X can natively read. Occasionally, Apple will add support for new RAW formats via system updates. There are many file extensions for RAW files. SVG stands for scalable vector graphics. Acorn offers basic SVG support. You can export documents and shape layers as simple SVG files. If there are no shape layers in your image, then the SVG export option will be grayed out. Additionally, this is a pure vector export- any bitmap operations like layer filters or masks are ignored for SVG export. Acorn can open basic SVG files. Read more about SVG on Wikipedia. TGA stands for Truevision Graphics Adaptor. If you are running 10.11+ Acorn can open and export your image in the TGA format. Read more about TGA on Wikipedia. TIFF stands for Tagged Image File Format. TIFF is a lossless 32 bit image format and can preserve transparency. Acorn can read and write TIFF images. Read more about TIFF on Wikipedia.